Which are the best domain endings for consumer trust? An interesting study on domain name preferences was released in February by Domain Name Association with help from research consultancy Research Now. 5.000 internet users were asked about their online habits. An interesting part of the study was the examination of which were the best domain endings, when it comes to consumer trust. The overall conclusion is that: 1) In the UK the co.uk domain ending is still very dominant, and .com is by far the most preferred domain ending in the US (Do other domain endings even exist?). 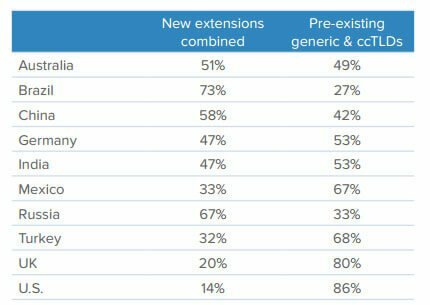 2) In most other countries surveyed internet users are just as prone to trust one of the new domain extensions. Even endings which still haven't been launched, but which just sounds like they deliver on their promise. Best domain endings according to the survey The 18 page survey has a wealth of information. In the following I've picked the most interesting parts. Additionally we have run our own survey in the UK to validate the conclusions. Check the results at the end of this post. In the table below you can see the general preference per country between new and classical domain endings (.bank is a new one,.com is a classic one). Let me run you through some of the most interesting questions asked in the survey. Where would you go to pay your bills?Below you can see the survey results for four countries: The US, Germany, India and Mexico. Conclusively, the majority of internet users put most trust in their country's own domain ending. However, more interestingly, around half of internet users chose as the best domain ending one of the new domain ending options. The .Bank extension has its Sunrise release in May and is set to be the trustworthy domain ending which financial institutions have requested for years. .Secure was another ending directed at banks, which was well received. Where would you go to buy shoes online? This other survey question is interesting for e-commerce sites. How much do we trust a specific domain ending that they use? The survey results below are from the US and Australia. 83% of US internet users preferred .com. In Australia the local country code com.au was the most trusted domain ending (42,5%), however notice that 33% of Australian respondents opted for shoes.melbourne. There is a good reason though that only 2.7% US users preferred shoes.nyc, while 33% of Australians preferred shoes.melbourne. In Australia for some reason the question had been changed to Where would you buy shoes if you live in (city)? An annoying flaw in an otherwise eye opening study. Where would you go for news and information about current events? If you have a news or events site you might consider another domain ending than .com. Check for instance the numbers for two large countries such as Russia and Brazil. A total of 58% and 67% of respectively confided in a new domain ending. Notice for instance how strong a dot city domain is for local news (.rio will go live in March 2015), and how well a .news could work in Brazil. Also check how well a Cyrillic domain name will work in Russia. We know by now that for instance that Chinese language domains have had a lot of success, so it's no surprise that local character domains are very well accepted. Our own UK survey To test these questions we ran our own survey. 500 respondents located in the UK answered the following questions: Where would you go to buy shoes online? The survey confirmed that UK respondents confide primarily in the co.uk ending. Somewhat surprisingly shoes.shop is more preferred than shoes.com. In the Australian study .shop was also preferred to .com. Interestingly, more than half of the respondents in the two youngest age groups (18-24 years and 25-34 years) preferred co.uk, while the +65 years respondents preferred .shop. So if you cater to an older customer group, you might consider this. Where would you go to pay your bills online? Again, co.uk was preferred, however not far behind comes .bank. The trust in .bank was also proven in the latter study. Both in Germany, India and Mexico .bank got more than 20% of the votes. It is interesting to note that the two oldest age groups (55-64 and +65) both preferred the .bank domain as the trusted place to pay their online bills. Conclusion You might have thought that .com was the only answer to have a killer domain name for your web shop. Think again. Apart from the US the new domain endings and country code domains were preferred to a .com. If you're starting up a web shop today, you could definitely go for your KEYWORD.shop, .bike, .app or whichever new domain ending is possible now (Check the list here). If you're a financial entity you should look into .bank set to be released on 1st June. It could be the extension widely used in the banking community from now on.